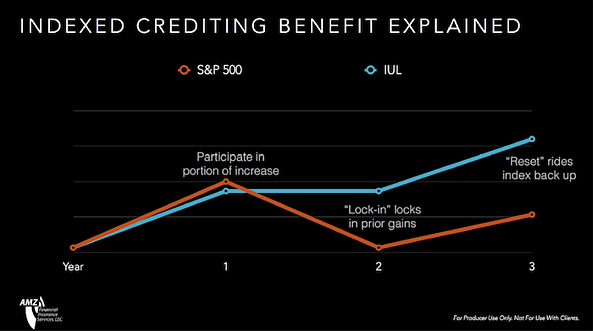 A very basic way to understand how Indexed Universal Life (IUL) credits interest is to think of it like a very simple game where you flip a coin 10 times. There are then two ways to play the game. In Game 1 you win $100 for every head, and lose $100 for every tail. Game 2 awards you $70 for every head, but you lose nothing for every tail. In the chart above you can see how this game plays out in four different market conditions. In the bull market condition, 80% of the flips are heads, and 20% of the flips are tails. Obviously in a bull market, choosing Game 1 is marginally better than Game 2. In a bear market, where the conditions are the exact opposite of the bull market, 20% of the results are heads and 80% of the results are tails. In this market scenario, Game 2 is dramatically better than Game 1. Next is a flat market and you win 50% of the time and lose 50% of the time. Again, in this market, Game 2 outperforms a simple break even of Game 1. Last we have the likely market, where 70% of the time you get heads and 30% of the time you get tails. Again in this scenario Game 2 fares better. 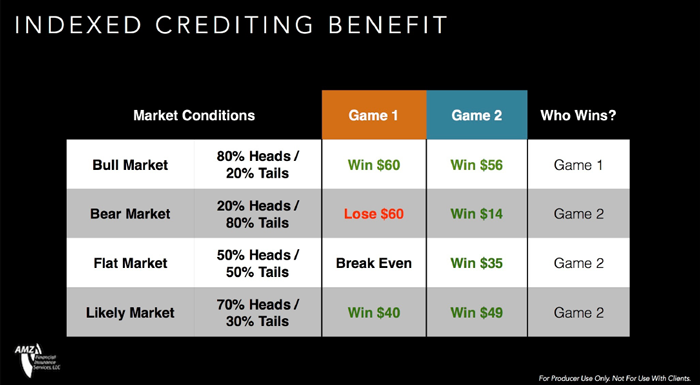 So, for those clients who would rather have a chance at winning something, but not risk loss, the indexed crediting method (Game 2) makes sense. Let’s briefly explain the basic mechanics of an index crediting method against the raw performance of an index like the S&P 500. In the first year, the S&P 500 earns 100% of what the S&P 500 earns. The IUL policy is capped on the upside potential, so in this example it earns about 30% less than the raw market. In the second year, the S&P 500 drops back down, since the market can move both up and down. The IUL does not experience the loss in a down year, and locks-in the prior year’s gains. If in the third year the S&P 500 once again goes up, both lines go up, and the annual reset allows the IUL policy to ride the index up. You can see in the chart above how avoiding the market losses can make an impact after down years. Let’s take a historical look back as it relates to the raw performance of the S&P 500 against a hypothetical IUL policy with a 12% cap. Obviously, when the market is on a bull run as we experienced in the late 1990s, the raw market outperforms the IUL policy. When the volatile market shows itself, the IUL doesn’t give back the gains it earned during the bull market run. It can ride back up during those years when the index is moving in a positive direction. As always, clients have options as to where they place their money, and one alternative to the volatile market is to place money into what many consider a “safe” investment, or a traditional fixed instrument. In this chart what we’re looking at is the bond yields from 1996 through 2016. You can see that bond yields have steadily declined since 1996. 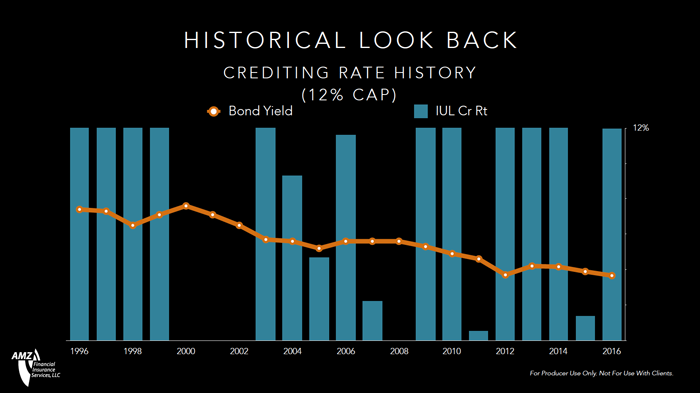 You can also see how an IUL with a 12% cap would have performed over that same time period. In some years we had losses in the market, so we don’t see any possible gains in those years, but we see that in 17 of the years, the IUL would have produced a return, and 11 of those years we would have hit the maximum return possible of 12%. Life is always about trade-offs. With an IUL policy your clients avoid market losses and gain protection when the market is down. They also earn up to a cap when the going is good, but don't participate in all of the market's growth. Additionally, over the long term, your clients have the opportunity to earn a rate better than a low-fixed rate financial instrument. Many advisors struggle with getting in front of the right target market for IUL. Download this valuable e-book "The Five Keys to Selling IUL Virtually" and you'll discover a better way to prospect and grow your business.